Kirkland, WA, November 27, 2000 — Real Time Integration announced today the NetAcquire™ Data Archiver, a high-capacity portable signal recording device with integrated playback capability. The NetAcquire Data Archiver samples analog, digital, and serial data signals at selectable speeds, and stores the data on an internal 10-gigabyte hard disk. Depending on acquisition speed, the system supports continuous gap-free signal recording from days to years. NetAcquire Data Archiver operates as a standalone device or as a network peripheral. When the NetAcquire is connected to an Ethernet network, the archived data files are available to any computer on the network using FTP (File Transfer Protocol). NetAcquire Data Archiver also supports standalone signal playback from recorded data files. Playback operation is configurable, including playback speed, start time, and auto-restart once end-of-data is reached. NetAcquire Data Archiver includes an integrated Web server, allowing remote system configuration and monitoring from any Web browser. For example, the amount of free disk space can be remotely monitored, and old archive data files removed if required. NetAcquire AutoFTP™ software is also included for archiving very large data sets AutoFTP runs on the NetAcquire and continuously transfers archive data files to a customer-supplied central file server. This supports very large disk capacities and hierarchical storage management into the terabyte range. Once AutoFTP confirms a successful file transfer, the associated data file is automatically removed from the internal NetAcquire hard disk to avoid disk overflow. Other NetAcquire Data Archiver capabilities include data time-stamping and power failure protection. Data time-stamping is available from the internal NetAcquire hardware clock, an external network time server, or an optional GPS satellite antenna. Power failure protection ensures that acquired data is written to the disk immediately and that the onboard disk file system is kept in a consistent state if power is lost. 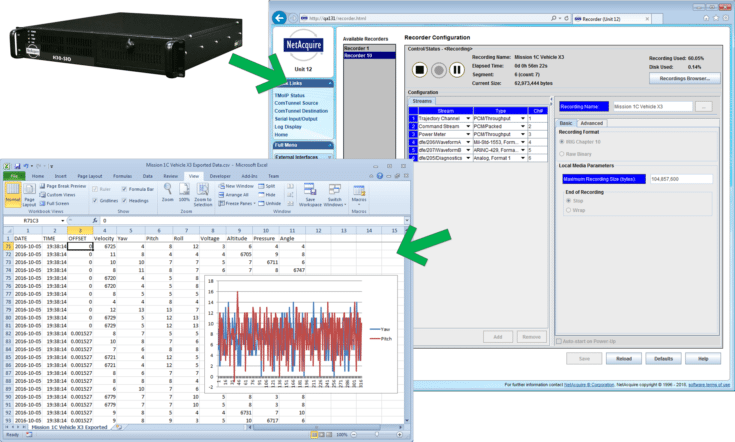 Expansion options for NetAcquire Data Archiver include expansion to 256 analog channels and 64 serial channels. Archive disk capacity can be increased from 10 gigabytes to 30 gigabytes. A RAID disk storage option is available for high-reliability environments, as well as a DLT tape auto-changer option that supports up to 240 gigabytes with 24 hour x 7 day continuous tape management. The NetAcquire product line is an ideal component for building enterprise-wide distributed test and measurement systems, as well as Internet-compatible systems that allow remote data acquisition and storage anywhere in the world. Real Time Integration, located in Kirkland, WA, provides real-time distributed hardware and software, data acquisition, and communications solutions to companies worldwide. Application areas include industrial process control, laboratory monitoring, distributed test and measurement, and satellite communications. The NetAcquire Data Archiver is priced at $6,495. Real Time Integration, NetAcquire, and AutoFTP are trademarks of Real Time Integration, Inc.